A Great Weekend in Charlotte for the Amerks · Let's Go Amerks! 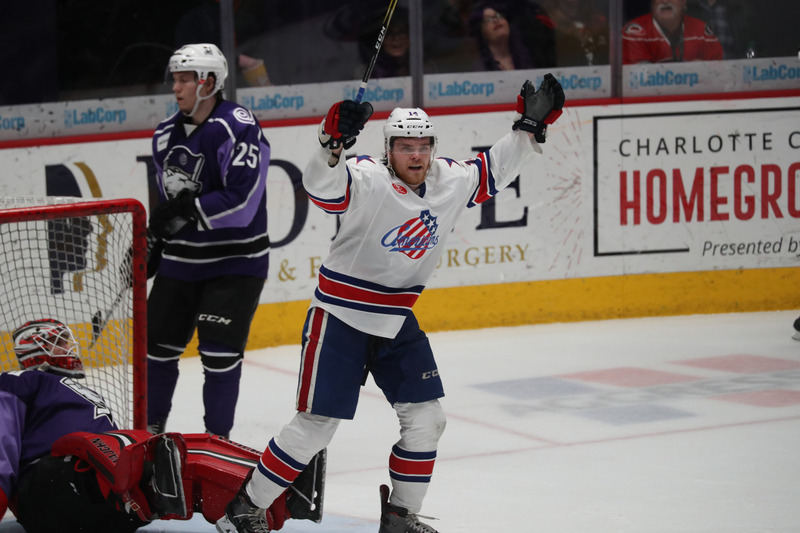 The Amerks spent the weekend in Charlotte for back to back games and came out on top with three of four points, scored eight goals, a commanding 4-1 win and pushed a game to overtime after being down three goals. That’s a great weekend on the road. The Amerks have earned points in four straight games and still have not gone back to back games without a point since October. The three point weekend keeps the team in second place in the division, second in the conference and third overall in the league. Adam Wilcox earned the win on Saturday with a 23 save performance. Linus Ullmark played on Sunday and had 23 saves in the loss. Ullmark has one regulation loss, two shootout losses and an overtime loss since returning from Buffalo. On Saturday evening the Amerks controlled the pace of the entire game and it showed on the scoreboard. Eric Cornel scored first after going 16 games without a goal. He created a turnover and buried a quick shot to the back of the net. Kyle Criscuolo used his quick speed to score a wrap around goal and the Amerks held a 2-0 lead heading out of the first period. Criscuolo appeared to score another goal in the second but after a replay the refs said no goal. Sean Malone ended his 23 game goal drought with his first of the weekend with less than five minutes left in the second period by redirecting a pass from a CJ Smith. Lucas Wallmark scored the only goal for the Checkers with 2:01 left in the second period. CJ Smith scored an empty net goal with 1:47 left in the game and finished with 1G+2A. The three point night put him back into second place for rookie scoring with 14G+23A. He’s three points behind Dylan Strome. Adam Wilcox was stellar in net again making 23 saves and earned the second star of the game, CJ Smith was number one star. The Checkers had a number of quality scoring chances but Wilcox was excellent again tracking the puck on every shot. On Sunday afternoon it was slightly different at the start but one of many things we’ve learned about this team through 43 games is that they don’t ever quit. Charlotte scored a breakaway goal 49 seconds into the game to take an early 1-0 lead. Sean Malone scored for the second time in two games at 5:35 of the first period. Justin Bailey put the initial shot on net with a back hand and Malone powered his way to the front to bury the rebound. Charlotte took a 2-1 lead from a snipe in the slot by Trevor Carrick. The shot was in the net before Ullmark had a chance to get set. Valentin Zykov makes goal scoring look easy and scored his first of the net at 1:16 in the second period by skating around Zach Redmond and pulling Ullmark out of position. The Checkers were up 3-1 at that point. Warren Foegele put the Checkers up 4-1 by finding a loose puck in the crease and they started thinking the game was in their hands. With 6:18 left in the second period Seth Griffith had the puck at the top of the face off circle, found a spot and put the Amerks within two goals. Also known as the worst lead in hockey. Linus Ullmark made a great sequence of saves late in the third period to keep the Amerks in the game. Hudson Fasching won a battle for the puck in the Checkers end, created the turnover and a perfect pass to Captain Kevin Porter to make it a 4-3 game with 4:29 left in the third. In a similar play, Hudson Fasching battled behind the net, spotted Porter out front and he scored again 2:01 left in the game to tie it up 4-4. With 25 seconds left in the third period Stuart Percy had a chance to go ahead 5-4 but doinked it off of the post. 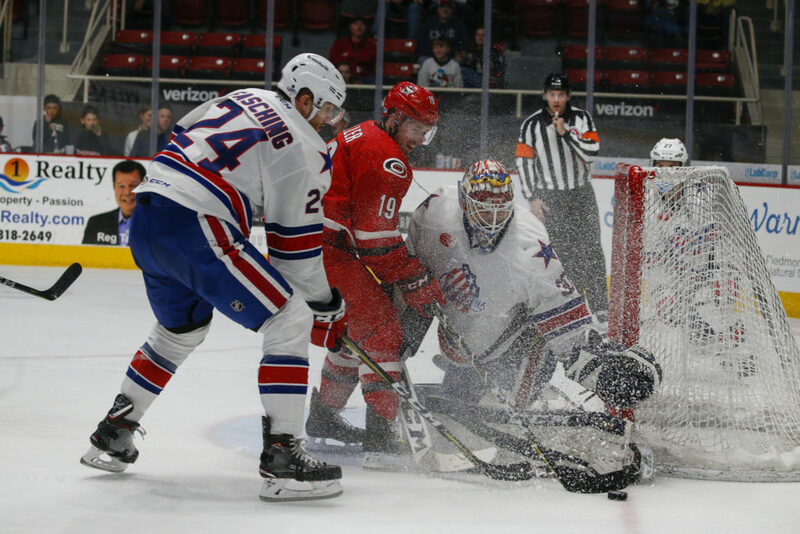 Seth Griffith went down the ice with Kyle Criscuolo in overtime in a two on one but Criscuolo was stopped by Checkers goalie Alex Nedeljkovic. After the save the play went back down the ice and Valentin Zykov scored again and the game winner in overtime and just made CJ Smith and Linus Ullmark look like silly. Kykov is tied for the league lead with 21 goals. The Amerks will be back home this week to practice before hitting the road next weekend to play Toronto on Friday night and then Belleville on Saturday.